Astonishing, just... astonishing. I've known for quite a while now that [J] is a total music snob, though she did give Europe a chance and soon after shat on it (terrible lyrics she noted), but this is a new low. [J] has disappeared this weekend and to do what you may ask? Well isn't this quite obvious. My spies have uncovered her handiwork. I say let the poor kids find their own path in music. This is outright oppressive. You should be ashamed of yourself, ashamed! I should go put on my spandex + exterior underwear and free these kids. Van Halen to the rescue. Jump! I say go ahead and jump! that's right, you called me out, what can i say? i just love sharing the good chunes...(i.e. rescuing the little ones from van halen). but as stated before, i dig how you defend your horrendous music. 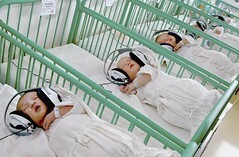 I need more explanation - are those babies supposed to have those headphones on? what's GOING ON!!?!?! and let's chill.k. sounds good.